We ask all blog publishers to help bring awareness to the world today on the dire situation with climate change and the need for action! Climate change affects us all and it threatens more than the environment. It threatens to cause famine, flooding, war, and millions of refugees. * A Technology or Business blog might write about emerging clean tech and how innovative companies might be able to help address the problem of climate change. * A Health or Lifestyle blog might write about how climate change will affect our children’s health and daily living. * A Nonprofit or Political blog might write about how climate change is deeply connected to many other issues – such as poverty and conflict. * A Design blog might write about new trends in eco-friendly or sustainable design. * A Travel blog might write about the places you want to see now before climate change makes them difficult to access or, well, under the sea. Please join the 7,037 blogs in 135 countries and 11,211,921 readers in uniting over this urgent issue! This entry was posted in Appreciation, Blogging, Community, Networking and tagged blog action day, climate chnage on October 14, 2009 by Jeff. I wanted to write up a quick shout-out to the great people that have commented on this blog since its inception and since I recently added the My Top Commentators plugin from Daily Blog Tips, it is fairly easy to see who has contributed the most to this blog. If you haven’t visited their sites, I ask that you please take a quick minute and look at them. If you are disappointed you didn’t make this list, and who wouldn’t be (*that was sarcasm*), then start leaving some more relevant comments, and next time I look at my top commentors, I will be able to link to you. Thanks again to all of you that take the time to voice your opinions on this blog. Without you, there wouldn’t be any reason for me to continue doing what I do here. Also, note that comment counts and placements are not entirely correct as people have used multiple e-mail addresses when leaving comments here, and the plugin doesn’t take that into account. This entry was posted in Appreciation, Community on August 4, 2008 by Admin. I have never tried to push my brand in order to get free things, and I probably never will, but I have always secretly hoped that all my hard work would be noticed by people, and in turn they would want to help me out, even in some small way. Most of the time, I am unfortunately disappointed as people say they are going to do something, but instead disappear off the face of the earth. I have always found that online people over promise and under deliver, but recently, I have had two examples of people doing quite the opposite. Back, earlier in the year, I attended Moosecamp and Northern Voice in beautiful British Columbia, and I met up with Matt Mullenweg and got to see Lloyd Budd once again. I mentioned how I would love to get a WordPress shirt at some point, but the cost of shipping made the whole thing prohibitively expensive. I had found it sort of ironic that I talked about WordPress all the time on various blogs, and podcasts, and didn’t have anything to show for it. I was honoured that Lloyd had me help out with his session about WordPress at Moosecamp, and he sweetened the deal by offering me a WordPress shirt. He said that it might take a while, but I would get it, and since then, I had totally forgot about it. I never really expected to get a WordPress shirt, and amusingly enough, a week after my transition out of being a full time blogger, a package arrives and inside is a WordPress hooded sweatshirt. Up to that point, I had been a little bummed out due to some personal life complications, but it felt like a sign that things were turning around for me in a very positive way. I also found it ironic that the only blog where I now had access to post about WordPress related content was here on Xfep, where I haven’t given WordPress as much focus as I have elsewhere. 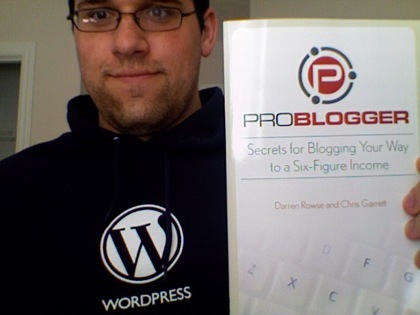 When I first heard about the Problogger book, it was already completed and Darren and Chris were already promoting it. I immediately signed up for their newsletter to get the sample chapter and was really impressed. I contacted Chris, and jokingly pointed out that he should be handing out copies to all his buddies, and interestingly enough, he said that he would send me a copy. After hearing how other people were grabbing copies of the book, I almost went out and purchased a copy, thinking that Chris had forgotten. Promoting a book is much more important than spending the time to make sure I got a copy, and so I wasn’t frustrated or annoyed with him at all. Today, a truck pulled up and handed me a small package. Sabine, my wife, looked at me and asked what it could be. I didn’t have any clue, and so before even signing for the package, I opened it up to reveal a small soft cover book including in large bold letters, Problogger. I have been reading and re-reading the sample chapter and gaining a little more insight each time, and now I can’t say that I am not distracted by having the book in hand to pour through and review. I can’t explain how excited I am, and I still plan on buying a copy or two to give out to some blogging friends of mine, as well as maybe a few to give away here. Chris and Darren deserve all the support we can give them with regards to the success of the book. Chris and Lloyd didn’t have to go above and beyond to fulfill the small mentions they made with regards to helping me out, and yet they did, and in doing so they made me feel very special, and appreciated, something that far too many people forget to do. I hope that they feel, in some small way, responsible for my happiness, and in turn feel happy themselves. They are great people, and deserve special recognition. And now, to close out this post, here is me, with a goofy grin, excited about my WordPress shirt and my Problogger book. This entry was posted in Appreciation, Problogging, WordPress on May 16, 2008 by Admin. It has been a long time since I last did a commenter appreciation post, but with the recent comments I have been getting from two people in particular, I had to take some time out of my day to feature them. Bloggers that I have known for some time have, for some unknown reason, taken time out of their life to add their thoughts and opinions to this blog, and I wanted to make sure that they know I appreciate it. So a big thanks from me goes out to Kevin and Jeff. Linking to his personal blog, System0 from the comments he leaves here, Kevin is better known in my mind as the owner of BloggingTips, a popular multi-author blog that covers all aspects of blogging. I have watched as he changed the staff and the design of his popular blog, and yet he still found time to come over here and say “hello” more than once. A great guy to get to know and I am glad he keeps stopping by. His personal blog covers the interactions he has with technology, video games and his day to day life. His opinions are usually in line with my own, which is always a plus in my book. Jeff, or Jeffro, runs the WordPress Weekly podcast, and writes for the very popular Weblog Tools Collection. He also works on his own blog Jeffro2pt0, where he talks about what is going on in the web 2.0 world, as well as covering blogging, and from time to time, WordPress. I have been on his WordPress Weekly show more than once, and I really appreciated the opportunity recently to break the news about my new career. Jeff has quickly become one of the voices online that I really enjoy tracking, and I see nothing but success for this guy. I have a feeling that he will be one of those people I will one day be telling people “I knew him before he became famous online”. If you aren’t watching what both of these guys are doing online, you are missing very important things. They both have different levels of experience, but they keep their ears to the ground when it comes to all things blogging. This entry was posted in Appreciation on May 9, 2008 by Admin. While compiling the new top 50 list for my recent post, I noticed some of the blogs I enjoy aren’t in that top 50, but I believe they should be, and so I am going to give them some recognition here today. There are specifically nine blogs I would like to highlight that are all listed in the 45n5.com Top 100 list, but aren’t in the top 50, but do have some great posts, ideas, or writers. If you haven’t checked out all these blogs before, have a look today. If you enjoy these blogs, make sure you subscribe. While I don’t always enjoy their designs, or the advertisements they display, I have found the above list to include some great bloggers who produce some great content. If we, the community, support them, they will hopefully be in the top 50 by the next time I write about it. Hopefully, they won’t push me out from my spot in the list though. This entry was posted in Appreciation on March 28, 2008 by Admin.